Unfortunately Im still sick..I have the mother of all colds..Im literally taking every cold, cough, sinus medicine I can find but nothing is working..boo!! Ok enough feeling sorry for myself..
and the odd hint of sunshine.. finally I can break out some spring items! Wearing my new printed sheer blouse from New Look which I featured in my pretty new things post last week...although I had to layer it up as its not that warm yet..
Sheer Blouse: New Look, Suede leggings and wedges: M&S, Chain dufflebag: BillyBag. so cute, i like your lipstick too! finally the weather nice in the UK for once ahaha! You look so pretty in pink. 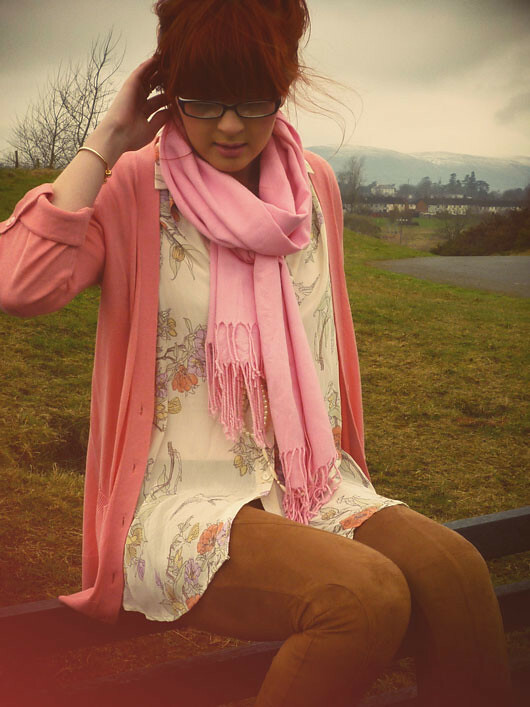 Love th shirt and leggings together and the cardigan is beyong gorgeous! Hope you start to feel better soon, I hatehatehate colds, I was full of urgh for my job interview the other week, my recommendation for a drug of choice: Contac 400- not a cure but help keep everything at bay so you can function as human being. your cardigan is so cute! actually, the whole outfit is cute! The blouse looks lovely with the pink and tan! Oooo this outfit is so cute! your lucky that you have such a bad cold but still look great. When I have a cold especially with sinus problems i just look like rudolf has been punched in the face. Lovely booties miss, get well soon! love that blouse! get well soon! you still look gorgeous. This outfit is so lovely, Really adore the colors here! And the print of your top is wonderful! This is such a lovely outfit hun :) I especially like the shirt, I have an obsession with floaty shirts and blouses! I'm sorry to hear your still not very well hun!When my Mr gets a particularly bad cold he uses Pulmo Bailey,its a super strength cold medicine.It tastes so disgusting,but he swares by it!You can get it from Boots,just make sure you've got a glass of pop ready if your going to give it a try! Aw man, I've had a horrible cold for almost two weeks! Crazy. Hope you feel better soon. You look adorable. I love this color scheme! So pretty. I think you must have given me your cold via the internet - I definitely feel your suffering! All I can recommend is lemsip, but I hope you feel better soon! I admire your commitment to blogging through your illness though, it's very impressive! 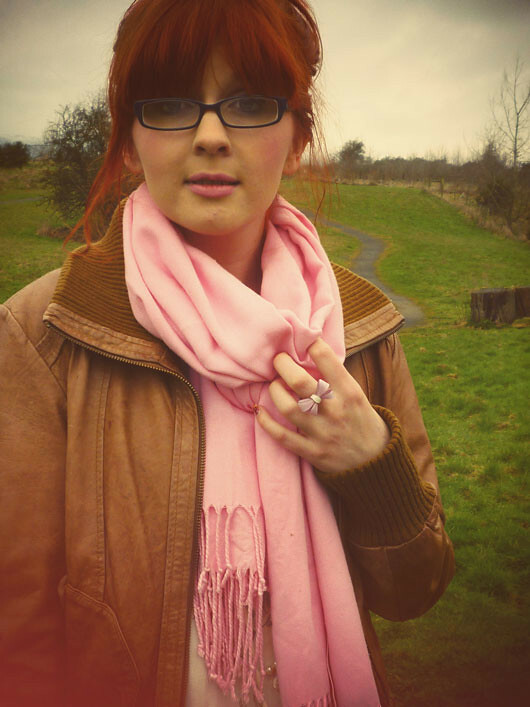 I adore the lovely pink and tan colours in this outfit, that ring is so cute! I love your bomber jacket! It's too cute! And I am still absolutely in love with your hair color! I love the way you match colours together, you seem to have such an eye for it! The blouse is gorgeous! oh my..i really hope you start feeling better soon! Aw, so sorry to hear you're still poorly. Hope you're snuggled up in bed looking after yourself! Seriously, I want every outfit you wear, I really love the pinks and tan together, absolutely lovely :) GET WELL SOON!! You are looking lovely in this outfit as always. Do take care, drinks lots of water and rest up! Get well soon! Get well soon! You're looking lovely, at least! Such pretty colors! love these photos and especially love your wedges. I need to get over my phobia of heels and get some wedges because they're so comfy and I think maybe I can walk in them without looking like an elephant! I am so loving the colours, the pinks and the print on your top is gorgeous. GREAT shoes! They look like so much fun! I love the leggings - wouldn't have thought they were from M&S! that cold is not leaving me!!! your hair is such a great color, and i love the pink scarf. everything about this outfit is so cute! 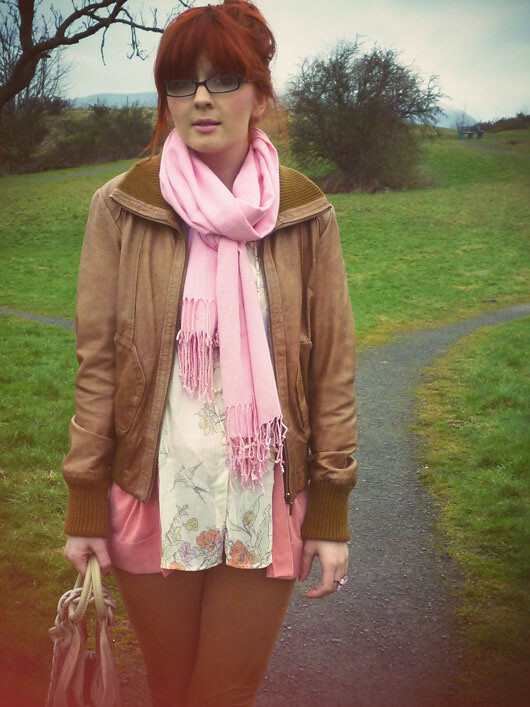 I love the pink and camel-ish colour together, I would never have put those two together but it looks fab! Again, I adore that cardigan. The color makes me so so happy - I think I am going thrifting this weekend to find something similar.. I love your cardigan and the soft pink. Get well soon and take care of yourself. Oh, and I hope you get better soon! Pink just looks amazing with your hair :) Stupid cold. Feel better soon! I love the last shot and how you pieced the colors together. beautiful.